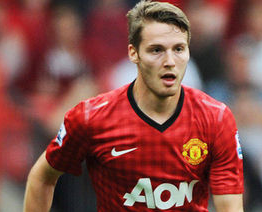 28th Jan 2015 – There are strong rumours that City are showing an interest in bringing Manchester United’s attacking midfield player Nick Powell to the KC, possibly on loan. Mike Phelan has wetted Bruce’s appetite for a deal, and it sounds right as United will want him to get games after seeing how Leicester lost interest in the supposed season long loan for the 20 year old. This season has been wasted for him – in the Premier League he has not featured in any starting 11, has come off the bench for Leicester 3 times (81′ 73′ and 76′) and been unused on the Fox’s bench once. His other football has been when he was substituted off on 57′ in the humiliating ManUtd 4-0 loss at MK Dons in the League Cup, 4 appearances for Leicester U21’s and 2 appearances for ManUtd U21’s. The two footed youngster can also play central midfield/striker and would slot into Bruce’s injury hit squad easily if motivated. He is under contract to the Reds until end of June 2016, and has a £3m to £4m market value. 25th Jan 2015 – How many times has Jordan Rhodes been linked to Hull City? Fair enough it’s been fans as well as the press, but it’s happening again, like something that’s meant to be. Nothing concrete of course just circumstances. Maybe this time? It again doesn’t seem likely unless Bruce does have real cash to play with and he’s kept it quiet.Last time City’s £10m offfer was not enough. Blackburn have him under contract until June 2019 so have a lot of bargaining power. The HDM report that Swansea (wash with Bony money soon) are already talking and the deal could be worth as much as £11m, so why are the Tigers linked? Now is not the time to plunge into big money transfers….it’s far too risky and would most likely breach Financial Fair Play Regulations. Better surely to get some fresh players in to tide us over the injury crisis and at the same time freshen up the squad. Enough cash was spent in the Summer. 24th Jan 2015 – Hull Manager Steve Bruce is currently in Portugal with his squad for a warm-weather training camp. City are linked with the following players during the January window driven by the clubs urgent need for replacements to cover that long injury list suffered so far in the campaign. But first, it sounds like Mike Phelan has agreed to be assistant manager to Steve Bruce, this is great news – we now have two of Ferguson’s right hand men at the KC. Aaron Lennon – City have made enquiries to Tottenham for the 27 year old right winger and would probably be looking for a loan agreement if possible. City have done a lot of business with Spurs in the past and a deal could be close. But do we want an outright winger? His overall goals tally is 1 in 14 matches and we only have 16 left this season. Dame N’Doye, the 29 year old Senagalese striker who plays for Lokomotiv Moscow. His current contract ends this summer and the Russian club appear to wanting £3m for him. His known club and country career so far records 239 games 139 goals. He is currently playing in the African Cup of Nations so won’t be available any time soon, and goals are needed now. Shola Ameobi (a free agent) has been considered by all accounts by Steve Bruce but it seems West Brom are close to tying up a deal for the 33 year old Nigerian winger/striker. Callum McManaman a 23 year old right footed striker or winger who has played for Wigan Athletic since 2007. Callum has a contract with them until the end of June 2017. He has scored 10 goals for Wigan in 72 appearances, and won the FA Cup with them in 2013, whilst also appearing for the England U20’s times in 2011 (no goals). His value is probably around the £3m mark, but Wigan don’t want to let him go below £5m so it seems. Daryl Murphy is a 31 year old 6’3″ striker who pays for Ipswich Town. He can also play on both wings. His contract expires at the end of June this year. If Ipswich will let him go the Tigers could get an experienced player for around £300k. Daryl has played 71 league games for Ipswich scoring 31 goals. He played 3 seasons in the Premier League for Sunderland 2007 to 2010 scoring just 3 times. 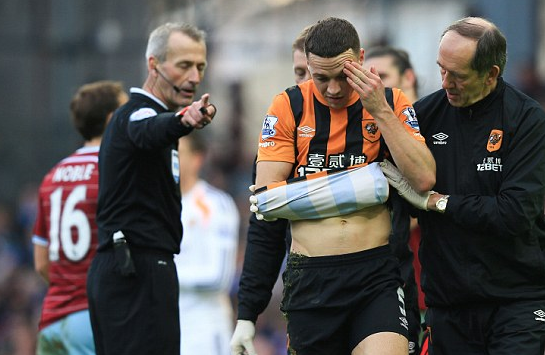 19th January 2015 Monday – Reports are the prognosis for the dislocated shoulder James Chester suffered at West Ham on Sunday is for him to be 8 to 10 weeks out of the game. Surgery is required. 18th Jan 2015 – Steve Bruce must be pulling his hair out, City took the game to the hammers in the first 45′ but it was that well worn story of not taking chances which cost City this game. That and the injury hoodoo striking again. Last week two strikers, this week two defenders (Bruce and Chester). Chester has a dislocated shoulder from a foul in the 6 yard box by Collins. At half time all seemed well at 0-0, possession had been 50% each and City had shown good attacking form, except that nagging feeling the 2nd half would be a different story, and it was. So that’s 10 players out through injury. Without Bruce and Chester the Steve Bruce game plan which had worked so well was torn up and the squad could not cope with a home side who had received a tongue lashing at half time. Goals from Carroll 49′, Amalfitano 69′ and finally Downing 72′ put City to the sword and showed what a superior attacking side they are. 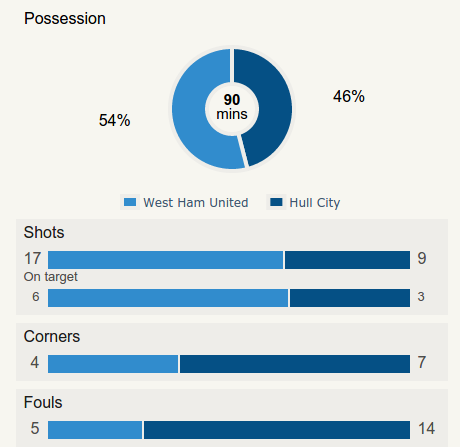 This patched up Tigers squad proved toothless in the final third, but the Hammers where not. Time and again City nibbled at the edge of the 18 yard box and lost the ball, while West Ham then stormed up-field with telling passes and either scored or came close. New recruits up front needed, as Steve Bruce knows and he is expected to bring in at least two forwards – not an easy task – but an interesting time ahead. City are stuck in the bottom 3 on 19 points. “For all the good play we had in the first half, the one thing we needed to do was score, especially with the chances and opportunities that we had,” said Bruce. “The way we played in that first 45 minutes delighted me. Then we gifted them a goal early in the second half and it was an awful mistake from the goalkeeper. He knows he should do better. From being on the front foot, we’re suddenly 1-0 down within two or three minutes. “Chester will probably need an operation and if that is the case then I would have thought he will miss at least two or three months,” added the manager. Hull City: Allan McGregor, Alex Bruce (Harry Maguire 46), James Chester (Maynor Figueroa 45), Curtis Davies (Yannick Sagbo 72), David Meyler, Tom Huddlestone, Jake Livermore, Michael Dawson, Sone Aluko, Ahmed Elmohamady, Stephen Quinn. Subs Not Used: Steve Harper, Paul McShane, Tom Ince, Gaston Ramirez. West Ham: Adrian, Aaron Cresswell, Kevin Nolan, James Tomkins (Joey O’Brien 76), Andy Carroll, Stewart Downing, Mark Noble (Morgan Amalfitano 65), Carl Jenkinson, James Collins (Winston Reid 49), Alex Song, Enner Valencia. Subs Not Used: Jussi Jaaskelainen, Matt Jarvis, Joey O’Brien, Diego Poyet, Carlton Cole. Poor Referee: Martin Atkinson 4 out of 10. 15th Jan 2015 – Hull City and Blackpool have reached agreement we understand via the compensation panel meeting today. No confirmation yet but it’s reported The Tiger will pay 2 million quid now and a formula has been agreed for extra cash based on performance of the player etc. This is probably what City would have agreed with Blackpool some time ago but they where holding out for 8 million pounds.